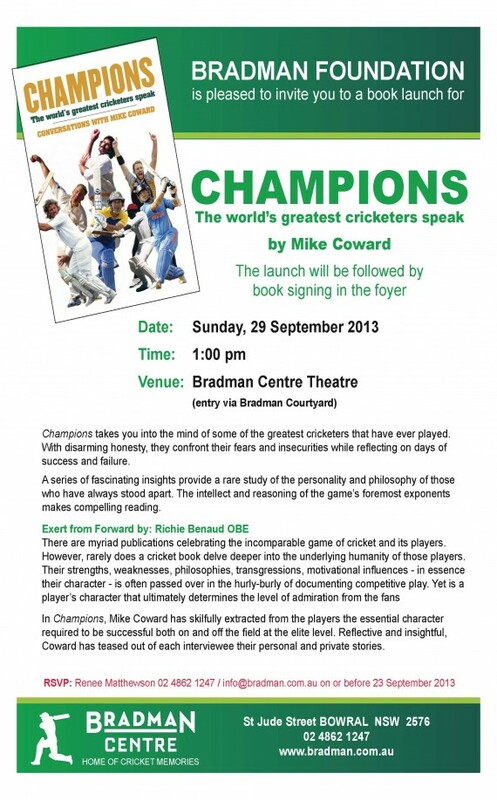 Bradman Book Launch | The International Cricket Hall of Fame. The sheer rawness of interview-based books has always appealed. They are totally genuine, the words spoken straight from the heart. Few are more passionate in their love of reporting those quotes than Mike Coward, one of the great names in Australian sports journalism who has interviewed more of cricket’s biggest names than just anyone alive. Fifty-eight of his best interviews are reproduced in his 13th cricket book, Champions – The World’s Greatest Cricketers Speak. Included are two who recently passed in Tony Greig and Mansur Ali Khan Pataudi. ‘To have lost those two so suddenly – plus Christopher Martin-Jenkins – all within months of each other is very sobering,’ says Coward, who introduces a veritable cricketing who’s who, neatly laid out in sections such as Courage, Leadership, Philosophy and Humor. He conducted more than 100 interviews for the Bradman Museum, the co-publisher of this book – and for those who can’t get to Bowral to hear them, a low-cost ‘app’ is available. There are five knights interviewed: Botham, Hadlee, Hall, Richards and Parkinson – plus Baroness Rachel Heyhoe-Flint who talks with pride at her successful drive to have women admitted at Lord’s. She also talks of her distinguished playing career and explains how she made Princess Anne explode with laughter. This is a wonderful book which makes you hope there can be a Volume Two!